Yesterday, the Cook Political Report released the 20th Anniversary Edition of the Partisan Voter Index (PVI). First published in 1997, the Cook PVI rates the degree to which a congressional district leans Republican or Democrat by comparing the district's performance in presidential elections to the nation as a whole. 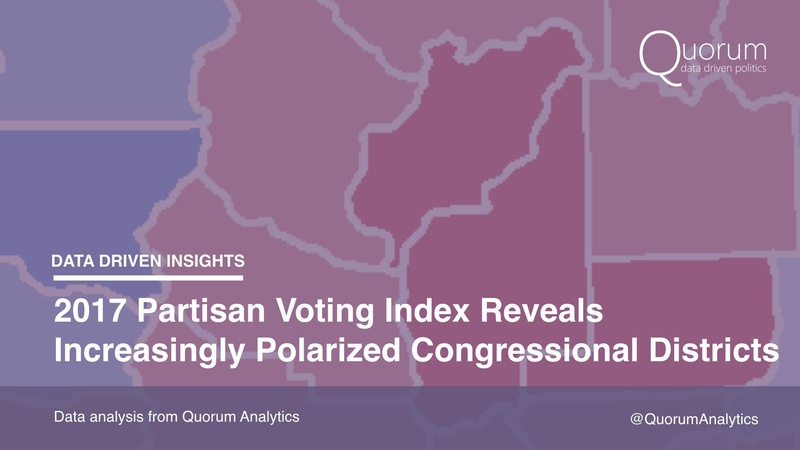 The Cook PVI tracks the partisan ratings of all 435 congressional districts and all 50 states. For more than two decades, the PVI has helped map the trends of our country’s shifting political landscape. The release of the 2017 PVI ratings reveal powerful insights into the post-Trump electorate. The number of congressional swing districts has reached a 20-year low. A swing district, according to Cook, is defined by a PVI rating ranging from D+5 to R+5. Following the 2012 presidential election, there were 90 swing districts. Four years later, there are 72 … 9 districts now lean more Democratic and 9 districts lean more Republican. 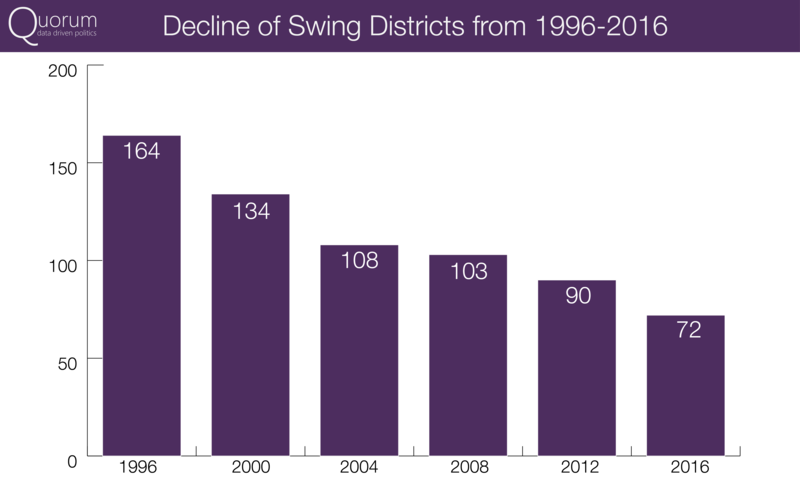 This 18 district drop is only a fraction of the 56% decline in swing districts over the past 20 years from 164 in 1996 to 72 in 2016. Four Democrats hold seats in the top 25 Republican-trending districts. Rep. Peterson (MN-07), Nolan (MN-08), Cartwright (PA-17), and Kind (WI-03) all serve in districts that have shifted 5-6 points to the right since 2012. Rep. Peterson’s district has doubled its R+ rating, Rep. Nolan and Rep. Cartwright’s districts have flipped from Democrat to Republican, and Rep. Kind’s district has dropped from D+5 to EVEN. Among these four at-risk Democrats, Rep. Peterson most frequently votes across party lines -- voting with his party only 74% of the time. All members except Rep. Cartwright have served in the House for more than 20 years. Eight Republicans hold seats in the top 25 Democratic-trending districts. Rep. Culberson (TX-07), Ros-Lehtinen (FL-27), Diaz-Balart (FL-25), Poe (TX-02), Woodall (GA-07), Olson (TX-22), Sessions (TX-32), and Curbelo (FL-26) all serve in districts that have shifted 4-6 points to the left since 2012. Of the eight members, 3 are from Florida and 4 are from Texas. Six of the 8 districts have dropped from a double-digit Republican rating to a single digit Republican rating, Rep. Lehtinen’s district has flipped from R+1 to D+4, and Rep. Curbelo’s D+1 district now leans D+6. Rep. Curbelo and Rep. Lehtinen are the only two at-risk Republicans that vote with their party less than 90% of the time. Democratic districts are far more partisan than Republican districts. 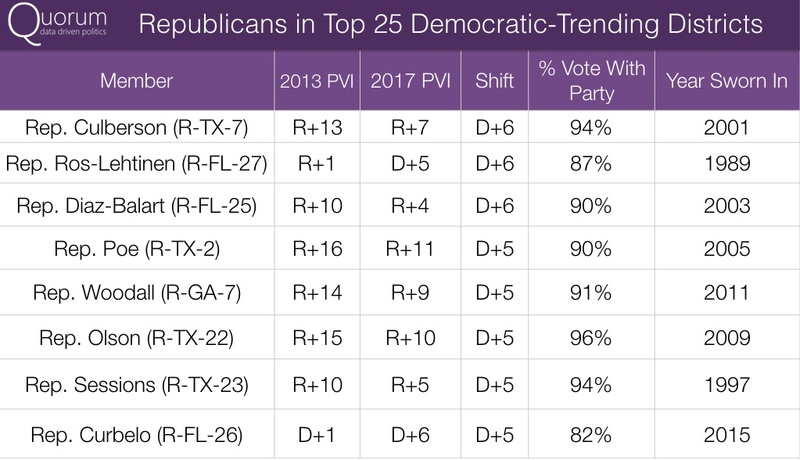 A look at the top 25 most Democrat and most Republican districts reveals top Democratic districts are further left than Republican districts are further right. There are 13 Democratic districts rated D+35 or greater whereas there are zero Republican districts rated R+35 or greater. The most Republican district is held by Rep. Thornberry (TX-13) at R+33 and the most Democratic district is held by Rep. Serrano (NY-15) at D+44. The 2017 PVI ratings reveal an increasingly polarized country. With the upcoming April town halls and the 2018 elections fast approaching, the PVI will serve as a valuable tool for identifying areas of vulnerability and, for some, opportunity. Congratulations to the entire team at the Cook Political Report for another insightful edition of the Partisan Voting Index. You received this email because you are subscribed to Quorum Blog Subscription from Quorum Analytics.